protect your investment and keep your grinder in tip top shape. The removal of the bearing on the newer models requires a little “finesse” to get it right. See our How-to video and checklist of recommended replacement parts; it’s probably time to give your grinder a once over and a lil’ love. If you’ve got a hankering for certain type of tungsten, look no further. At Arc-Zone, we offer all the popular tungsten types in our Amplify™ Brand: Thoriated, Zirconiated, Lanthanated, Ceriated, Pure, or Cryogenic Treated Thoriated. 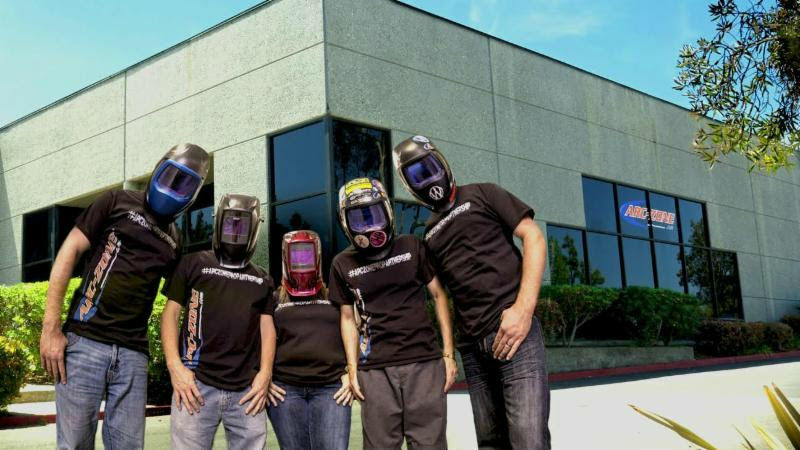 Our goal is to support you in getting the best quality weld – Every Time!!! And if you want a consistent, all around performance hybrid, we’ve always got our ArcTime™ Tungsten on hand. Would your custom-fabbed “bumper” plow through 14 years of memorabilia & remain in tact? Mythbusters always push the envelop and inspire us to approach each challenge with a creative mindset. We were sad to watch their final episode, but it definitely didn’t disappoint. Watch as their semi truck, outfitted with a 1/2″ steel cone, takes on a mile of props. Here’s a Go-Fast project from @bronantgnarbarian, a former Arc-Zone teammate & all around great guy. Evan welds aerospace parts in his “day” job, and in his spare time he joins form-function-beauty together for one sleek ride. To share your work with Arc-Zone, be sure to tag your pics with hashtag #ArcZone and #WeldLikeAPro. You’ve seen our products online, next time you’re in SoCal, experience Arc-Zone in a whole new way. Meet the Team and tour our facilities located in Carlsbad, California. You won’t be disappointed.